If you’re in the Florida area you need to attend this event! 1426 Fashion Week is set to launch November 7-10 with Media and Designers from around the country to take part in this event. Designers will be revealing their 2014 Spring and Summer collections. Models will have the opportunity to use 1426 Fashion Week as a means to improve their technique and to network with invited guest in the fashion industry. 1426 FW will kick of with our Meet & Greet, Jeans and Pearls on November 7, 2013 at 6 PM Eastern. An Empowerment Brunch will take place November 9 at 10 AM Eastern and followed by the Model Image Seminar and Designer Seminar. The focus of the event is to provide a platform for emerging designers. LS 1426 Inc is a modeling and designers consultant company, which focuses on educating High Fashion and Couture training. Which will also promote healthy self-esteem and a realistic lifestyle. This year host will be Nikki Mims Patterson, a retired plus size model who is now a Fashion Blogger for Southern Hollywood Productions, LLC out of Atlanta, Georgia. The main event will take place on November 10, 2013. Where the premier Designers will reveal their new lines and definite set trends for the upcoming fashion season. Part of proceeds will be going to Girl Power and Continues Love. Media passes are available please email channingls1426@gmail.com. The event will be preceded by the red carpet arrival of VIP guests. Pricing ranges from $35-55. 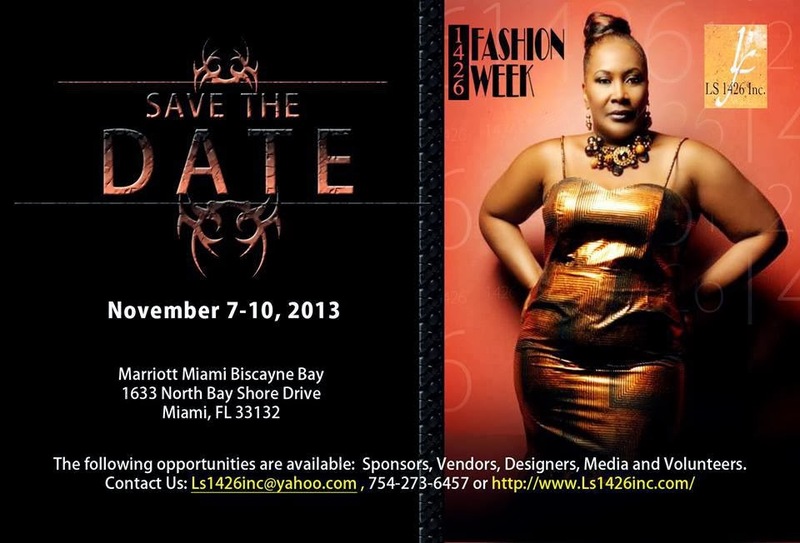 To purchase tickets please visit http://1426fashionweek-miami-eac2.eventbrite.com. Opportunities for Sponsors, Volunteers, and Vendors are available. For inquires please email channingls1426@gmail.com and/or contact Linda Scott at (754) 273-6457.